A 13.3-inch laptop tested with OS X Yosemite 10.10, an Intel Core i5 2.7GHz processor, 8GB of memory, Intel Iris Graphics 6100 graphics, and a 128GB solid state drive. The Apple MacBook Pro 13-inch MF839LL/A is a 13.3-inch laptop with a screen resolution of 2560 x 1600. It has 8GB of memory and a 128GB hard drive. It has an Intel Core i5 2.7GHz processor and Intel Iris Graphics 6100 video adapter but no dedicated video memory. But it lacks an optical drive for burning CDs or DVDs. It was tested with OS X Yosemite 10.10 installed. 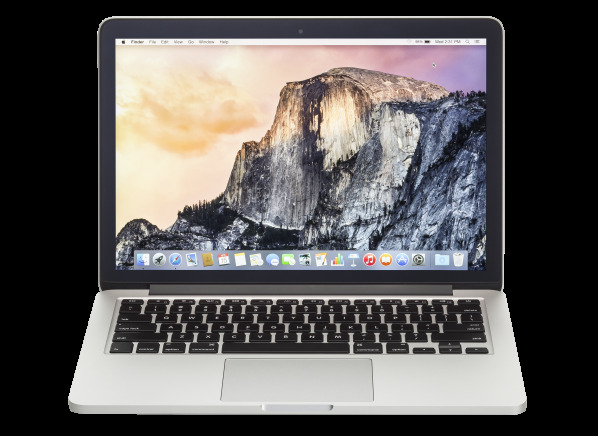 The MacBook Pro 13-inch MF839LL/A has an SD memory card reader for digital photography, and 2 full-size USB ports built-in on the laptop. It has HDMI out for connecting to an HDTV. You can use an 802.11n router, the most common high-speed standard or 802.11ac, with the latest, faster standard. The MacBook Pro 13-inch MF839LL/A measures 12.4 inches wide by 0.7 inches high by 8.6 inches deep and it weighs 3.5lbs. It's backed by a 12 month warranty, with 3 months of tech support.